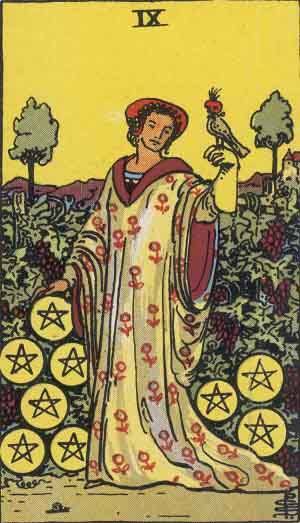 The Nine of Pentacles is the ninth card in the suit of Pentacles. Similar in appearance to The Seven of Pentacles with the plant imagery, but with stark differences. The illustration in the Seven of Pentacles shows a man resting after work and enjoying what he started a while ago, whereas the Nine of Pentacles shows a woman casually enjoying a garden, with no signs of labour, though a Falcon rests on her glove. The Nine of Pentacles represents luxury, financial security and self confidence. Past – The Nine of Pentacles in the Past position has a few interpretations, and it’ll depend of what you had in mind when you dealt the spread. Did you have a spoiled childhood where everything was taken care of for you? Did you have well-off parents? It might be affecting you now, and you may be finding it harder to relate to those less privileged. Having a good foundation for life can benefit us in many ways, so be grateful for where you have come from. Present – The Nine of Pentacles in the present position means life is going steady. It’s time to enjoy things that you’ve worked for, or obtained through other means. Pentacles are all about materialism and objects. You might find the things you have lacklustre and want to keep moving on and moving on. Be careful not to get into a cycle of buying newer versions and buying into new trends simply because you’re bored. Understand that it’s all a cycle of buying, using, and stopping. Once you understand it’s a full circle, you’ll be better off without. If you’re feeling spontaneous, now is the time to just pack up some things and go explore. Future – The Nine of Pentacles in the future position suggests a fairy tale ending. It’s a good card to see in the future position, and should give you a sense of hope that everything will eventually work out. Think about that for a while though; do you think you’ll attain your goals and be happy, or later in life simply prioritise your goals? You don’t know where you’ll be in a few years time, but drawing the Nine of Pentacles suggests that your future will be bright, positive and fulfilling. Work / Education – The Nine of Pentacles in regards to work can strongly suggest a promotion. In regards to education, it might mean that you’ve hit the sweet spot where your teachers know you understand the work and ask you fewer questions. You have gained their trust. Expect good things all round when the Nine of Pentacles shows up for work or education. The only bad thing the Nine of Pentacles can suggest is that you may have reached your peak in your current workplace. If this is the case, then simply look elsewhere. Your experience should open new doors for you. Romance – The Nine of Pentacles in romance is a very good sign. Do you want to be single? Do you want a new level of relationship, or a new relationship altogether? Any choice is possible. Many things that happen in a relationship seem like a big deal at the time, but when you really think over it, it’s nothing. Don’t blow things out of proportion, you’re comfortable where you are now, and there’s no reason to change. Friends – The Nine of Pentacles in regards to friendship means things are going well. Don’t expect any arguments or gossip now or in the near future. It might be a good time to get into some deep conversations with your friends, but isn’t it always? Be happy with your current friendships and let them know. Money – The Nine of Pentacles in regards to finances is a great sign. This card really is very positive in this aspect. Are you looking for work or have things taken a bad turn? Expect the unexpected, but from somewhere familiar. If you regularly do the lottery, expect a surprising sum, but it’s more probably that something like a payment of inheritance, or a large sum of owed money is coming back to you. Health – The Nine of Pentacles is good when placed for health. You should be in a period where you don’t need to concern yourself with health. If you aren’t, and are suffering, think about how you felt when you had no concern. how was your life different? If you can, try to emulate how you acted then. Spirituality and Mentality – The Nine of Pentacles in spirituality means that now might be a good time to just relax and not trouble yourself with deeper matters. If you have time, think about how blessed your life is. Even when we think we have it worst, we really don’t, it’s all a matter of relativity. In reverse, the Nine of Pentacles can show cracks that are beginning to appear in your current, stable life. Perhaps things are not as solid as they seem, and you might not be seeing the symptoms or cause just yet. It can also represent an idyllic life you are aiming for, but something, is stopping you from achieving it. It may be worth your while to think about why you aren’t already achieving your goal, identify and problems and work towards solving them. Nine represents completion and resolution. The Nine of Pentacles in regards to numerology may reflect your material wealth. You would do well to give away things you do not need. We hang on to a lot of possessions that would really help those less fortunate. You are secure in life right now, think about how you can help others, especially if this isn’t something you do regularly. Many nines in a reading suggest that your current situation is coming to an end, and a new cycle is just around the corner. We’ve selected live tarot readers to give you a FREE 3 Minute interpretation of The Nine of Pentacles! Scroll through them below and pick your favorite one.